Take a moment to collect all the gems you can, without running into trees, a witch, or any of those nasty gem eaters! Hear is another game from my past I avoided more then enjoyed. 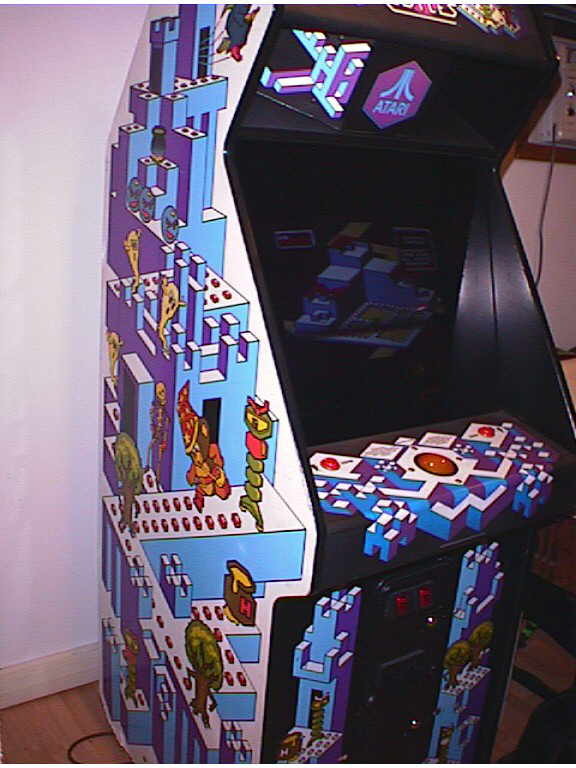 There was a Crystal Castle at my Arcade 'watering hole' for some time in the 80s, but although I occasionally dropped a coin in, from time to time, I was never good enough to get into the game and tended to pass it by more times then not. Now days, reliving my second arcade childhood, I find the game quite enjoyable. 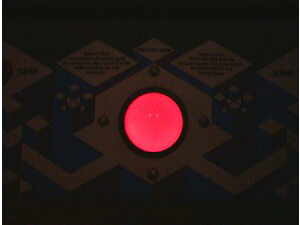 Maybe the arcade ran the difficulty of the machine too high for my abilities back then. 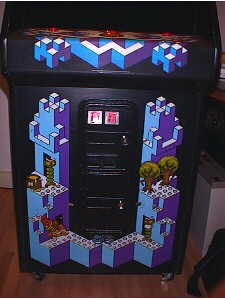 It als helps that my childeren enjoy it, calling it the "tree game"
Look at the cabinet this game came in! 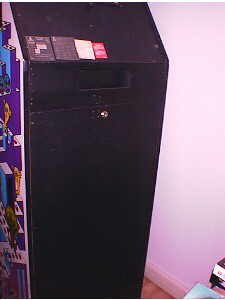 You will be hard presses to find a more attractive case from any arcade machine. An unusual cabinet shape with attractive side art and art on the front to add to the beauty. To add another spot of coolness, the track ball glows and flashes throughout the game. My Crystal Castle came from my local seller again (I definitely buy too much from this guy). The machine was overall clean and functioning, but I can never leave well enough alone. 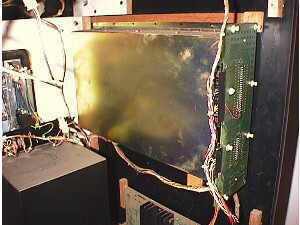 The original monitor was long gone but the original manuals for the original monitor could still be found inside the case. 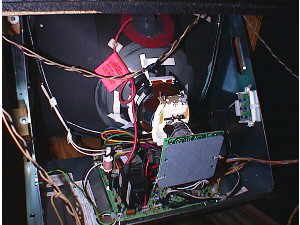 The original monitor (original a DISCO monitor) had been replaced with a Wells and Gardner 7000 series unit, but the screen burn from a Double Dragon was badly etched into the tube. The adjustments of the monitor was also slightly off, cutting out a small bit of the picture on both sides and no tweaking would stretch it out. I decided to see what I could do on the monitor. Happs sells a limited amount or repair parts for WG monitors, but they do sell width coils which I ordered and received within a week. Ten solder connections later the old part was out and the new part was in. And what did I end up with? An monitor with an adjustable width, no blue, and really bad Double Dragon burn in. I tossed the monitor in the trash and bought a brand new WG 7400 from Happs the next day. The coin door was a mess as usual, but I spend some time refurbishing coin doors some months ago and have 7 or so ready to drop in. The track ball was spotted with dirt so I took it all apart to clean the rust off the rollers and clean the ball. Nether the rollers nor the ball cleaned up well, so that too went in the trash for replacement with a brand new unit. The new trackball came complete with a wiring harness but some simple wire swapping was needed to make the Barney Bear move the way the ball is rolled. I cleaned off the control panel overlay and stared at it for a bit….. It isn't horrible So I chose to leave it alone for a few more years of wear, before I replace it with an NOS one. A little cleaning, some new T molding and Crystal Castle is a great addition to the Basement Arcade! 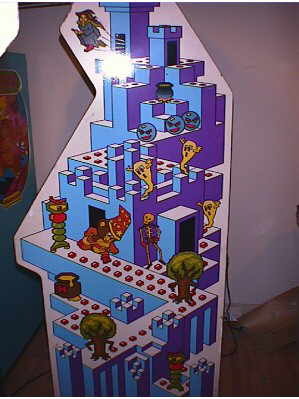 Do you have a Crystal Castle arcade game and need some of it's technical information? Visit the library for the full manual. Click Here for the Pin-out wiring page. My interest is strictly on full size arcade machines. But if you would like to take a shot at Emulating Crystal Castle, or any other arcade game on your computer, I do offer a link page on emulation. 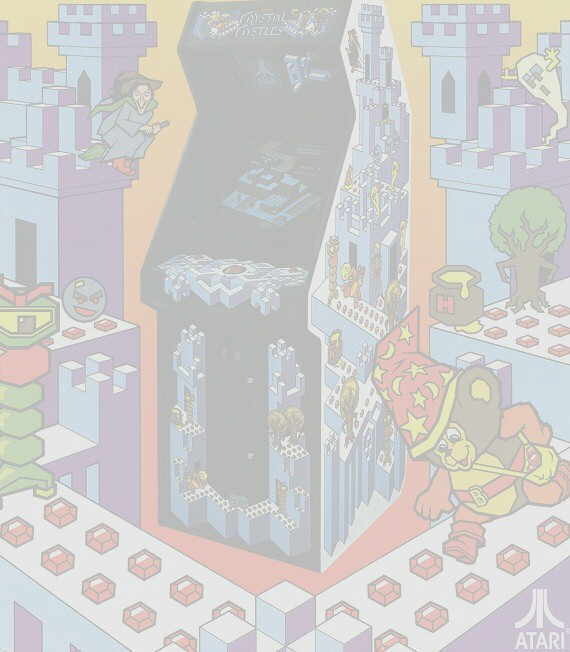 Visit http://www.basementarcade.com/arcade/mame/mame.html Visit the pages there, download the software for your machine and the ROM's for the games you want to play from the linked provided. Please redirect any further questions to the owners of these emulation pages as they are the experts!.